Trent Bridge Silences Barmy Army Trumpet Player : Parallels Music is a staple at sporting venues around the world (think singing, brass bands, even cowbells). And Billy Cooper's trumpet has been a steady fixture at England's cricketing contests. But not at Trent Bridge, where England faces Australia. The ground doesn't allow instruments. Not everyone's happy. Top cricketers and the media are piping in. 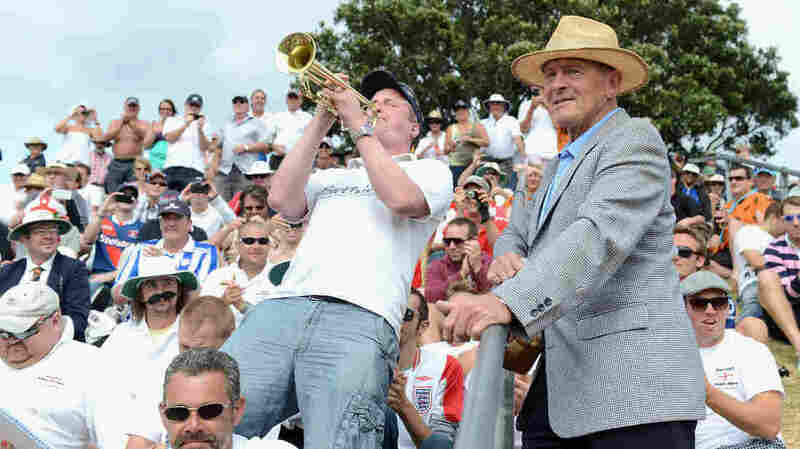 Former England cricketer Geoffrey Boycott listens to Barmy Army trumpeter Billy Cooper during the second test between New Zealand and England at Basin Reserve on March 15 in Wellington, New Zealand. Cooper's trumpet will be silent at Trent Bridge, in Nottingham, England, because the ground doesn't allow musical instruments. The English national character is an eternal mystery. But from time to time we get a glimpse of some of its components. The story of Billy The Trumpet is one such occasion. Billy is the embodiment of English eccentricity. He belongs to a boisterous ragtag band of sports fans called the Barmy Army. They're considered "barmy" for very good reason: These people follow England's national cricket team everywhere. They travel all over the world, sitting through rain and sweltering sunshine, watching games that can last up to five days, cheering and chanting lustily, even when defeat is certain. As his nickname suggests, Billy Cooper is a fine trumpeter. A decade or so ago, Billy started showing up for cricket matches with his instrument. His flawless renderings from within the crowd of the Blackadder theme, "YMCA" and — when England's about to lose — "The Last Post" — soon made him famous. Billy's trumpet became one of the signature sounds of the English summer, along with the crack of croquet mallets, whining lawn mowers and flying champagne corks. On Wednesday, a lot of English folk were looking forward to hearing Billy again. It's the opening day of international cricket's greatest contest of all — the five-match Ashes Series between England and its old archrival, and former colony, Australia. The first match is being played at one of England's finest cricket grounds, Trent Bridge, headquarters of Nottinghamshire County Cricket Club. There's great excitement in England and Down Under about the series. To mark the occasion, a military band played "Land of Hope and Glory" before the game on Wednesday. Jets from the Royal Air Force's aerobatic display team, the Red Arrows, zoomed overhead. The crowd sang lustily. There was not a peep out of Billy. "We just don't let musical instruments into Trent Bridge," Lisa Pursehouse, NCCC's chief executive, told Talksport Radio. It's not a matter of being "stuffy or boring," she explained; it's just that Trent Bridge is "an intimate ground" where "the atmosphere is created by the cricket." Billy's followers are not at all convinced by this argument. Two top England cricket stars have joined the fray; they say they like it when Billy's trumpet sounds. They want him to play. Britain's Guardian newspaper has weighed in, with an editorial headlined "In Praise of Billy The Trumpet." The editorial identifies two quintessentially English themes — class and tradition. "In the traditionalist view, test cricket should be watched in total silence by crowds who know their forelock-tugging place in the scheme of things," it says. It accuses Trent Bridge of trying to differentiate itself from "riff-raff" grounds (where Billy's allowed to play), and points out that the Barmy Army is paying plenty of money on tickets for The Ashes. So — it concludes — let Billy's trumpet sound.